The national football governing body said Thursday it will pit current men's national team boss Shin Tae-yong against other candidates in its coaching search. 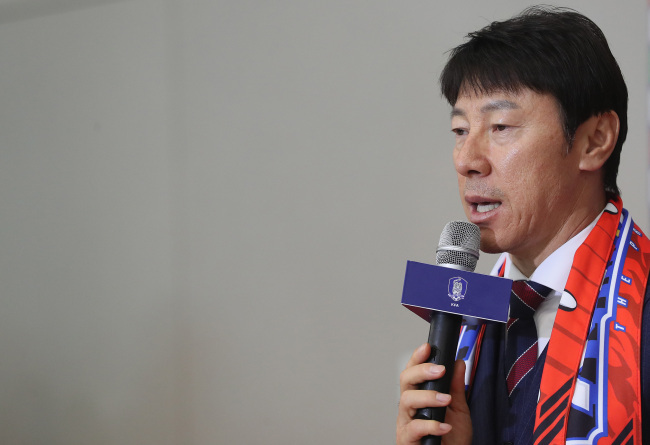 Kim Pan-gon, head of the national team coach appointment committee at the Korea Football Association, said he reached that conclusion following a meeting with a six-member sub-committee on the coaching selection. "We will regard Shin Tae-yong as one of the candidates, and he'll be up against other candidates being considered," Kim said, adding that the KFA has shortlisted "fewer than 10 candidates" for the position with hopes of finalizing the process before friendly matches in September. "We will interview these candidates and compare each one of them with Shin before we name the coach," Kim also said. With Shin at the helm, South Korea put up a win and two losses to be eliminated in group stage at the FIFA World Cup in Russia last month. South Korea opened the tournament with a 1-0 loss to Sweden and then a 2-0 defeat to Mexico, which led to harsh criticism of Shin. But they bounced back to stun the defending champions Germany 2-0 in the final group match. Shin, who'd previously coached the national under-20 and under-23 teams, replaced Uli Stielike on the senior squad on July 4 last year. His national team contract is set to expire at the end of this month. After returning home from Russia last Friday, Shin sidestepped a question on whether he hoped to stay on as the national team bench boss, saying he hadn't had time to put much thought into his job status. Following the review of Shin's performance in Russia, Kim said the World Cup was "neither a success nor a failure" for South Korea. "Shin put in so much work to prepare for the tournament and he led the team to the victory over Germany," Kim said. "But we also think that one year (before the World Cup) was plenty of time for him. While he might have worked hard, he didn't touch all the bases." Kim insisted Shin will be at the same starting line as everyone else, saying, "Just because we didn't renew his contract, it doesn't mean we didn't give him a vote of confidence." As for reports that former Brazil boss Luis Felipe Scolari could be line for the position, Kim said the KFA will look for candidates that best fit the team's philosophy. "You can't lead the South Korean national team just because you want to do it," Kim said. The KFA had already denied Scolari-related reports on Wednesday. Kim said the two key criteria in the coaching search will be the successful candidate's football philosophy and ability to produce results. "We have to play an active style of football, using penetration and forward passing, with stamina at the foundation," Kim said. "And the coach should produce results that befit our national team's status." Shin took over the team with two matches left in the final Asian World Cup qualifying round. South Korea managed back-to-back scoreless draws against Iran and Uzbekistan to barely scrape into the World Cup, prompting Shin's detractors to call for the return of former national team head coach Guus Hiddink, who guided South Korea to the semifinals at the 2002 World Cup. Shin coached South Korea to the championship at the East Asian Football Federation E-1 Football Championship in December last year. But it was soon followed by a series of uninspiring matches, and Shin entered the World Cup in the hot seat.